The best way to control barking is to be the one who encourages it. Some dogs will instinctively bark when someone arrives at the front door. It is a territorial instinct. However, this is not always appropriate behavior. Especially if you have regular visitors. 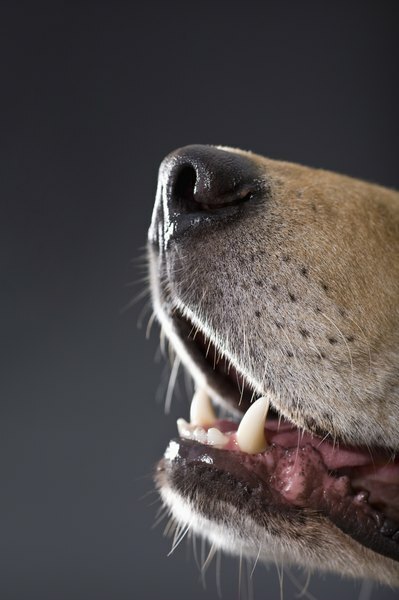 By teaching your dog to bark on command, you can control when and at whom he barks. Observe your dog over a period of three or four days and monitor his behavior. Make a list of the things that make him bark. If the doorbell is one of these things, that’s useful, but if it isn’t you can make the doorbell a bark trigger later. Pay special attention to his body language and note what he does directly before barking. For example, he may prick up his ears or start furiously wagging his tail. Expose him to a bark trigger. For example, turn on the vacuum cleaner, have a friend knock on the door or simply play with and fuss the dog until he lets out an excited play bark. Watch his body language and use what you learned from observing him to anticipate exactly when he’s about to bark. Say “speak” just before he barks. Once he barks, give him a food treat. Repeat the process, rewarding him each time he barks. Ignore the dog if he barks when not commanded. This exercises teaches the dog that barking in response to your command has a positive outcome, but barking independently has a negative outcome. With sufficient repetition, he’ll learn to only bark when commanded. Watch his body language again and look for signs that his excitement is passing. For example, he may begin to look away, his tail may stop wagging and his alert expression may recede. By waiting for a period of calmness, you can time the “quiet” command so he’s already behaving in the desired manner. This is more effective than repeating the command over and over in the hope he’ll eventually quiet down. Say “quiet” in a calm, confident tone as soon as you’re sure he’s done barking. Then give him another food treat. Repeat this command and give the treat each time he responds to the command by looking at you. If he barks, don’t give the treat. You’re teaching him to stop barking with the command “quiet” by showing him that calm, passive behavior directly after barking has a positive outcome. Take the dog to the front door. Have a friend or family member ring the doorbell or knock on the door. Directly after the doorbell or knocker sounds, issue the “speak” command. Reward the dog with food each time he barks in response to your command. Repeat the exercise every day for approximately 10 minutes. Over time, the dog will begin to associate the “speak” command with the sound of the doorbell or knocker. Issue the quiet command to stop him. Once you can control his barking with your voice, remove the “speak” command. Reward him with food when he barks at the doorbell or knocker. Then reward again when he responds to your “quiet” command. Ignore all other barks. Time your commands so you only give them when the dog is about to do what you want him to do. Otherwise, the command itself may become meaningless. Do Labradoodles Bark at All?